Once in a while, my mom would have a "fritay" night. I honestly have no idea what the English word for fritay is but it's basically an assortment of fried foods. Bannann peze is usually part of our fritay assortment and you have to top it off with pikliz of course. Bannann, or I should say plantains, are quite common in the Caribbean. They have the perfect environment for growing them. You have the green ones and you have the sweet ripe ones. I'm personally a fan of the green ones, especially when they are fried. You can have them boiled too, which is the way my mother likes them. Peze means press. So essentially, bannann peze is "pressed plantains". 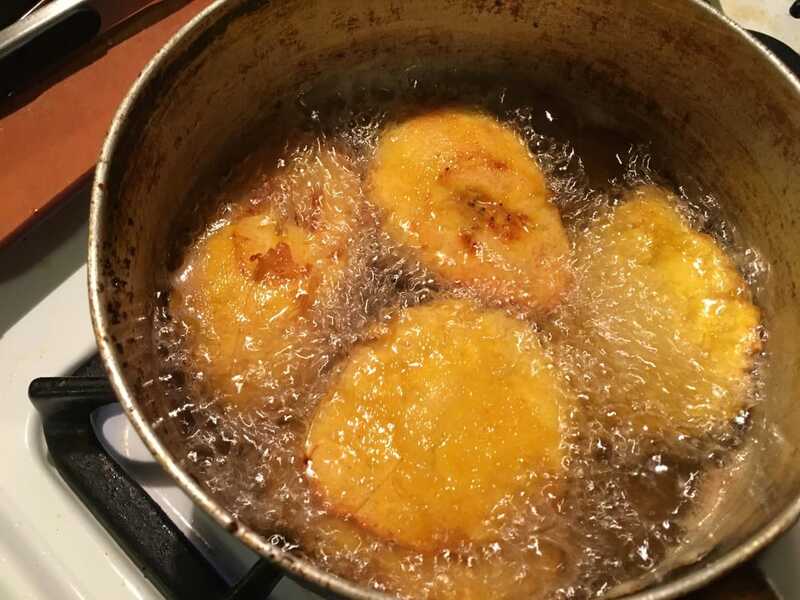 If fried the right way, they can be a delicious, crisp appetizer. My Hispanic friends know this well as "tostones". I'm not really sure what Hispanics usually pair this with but for us, pikliz is always the number one choice. Bannann Peze is one of those things that has to be eaten right away. Once it's cold and reheated, it's not that great (at least in my opinion). So if you've got some pikliz laying around and you're in the mood for something fried, make some bannann peze! 1. The first thing you want to do is get your oil prepared and heated. 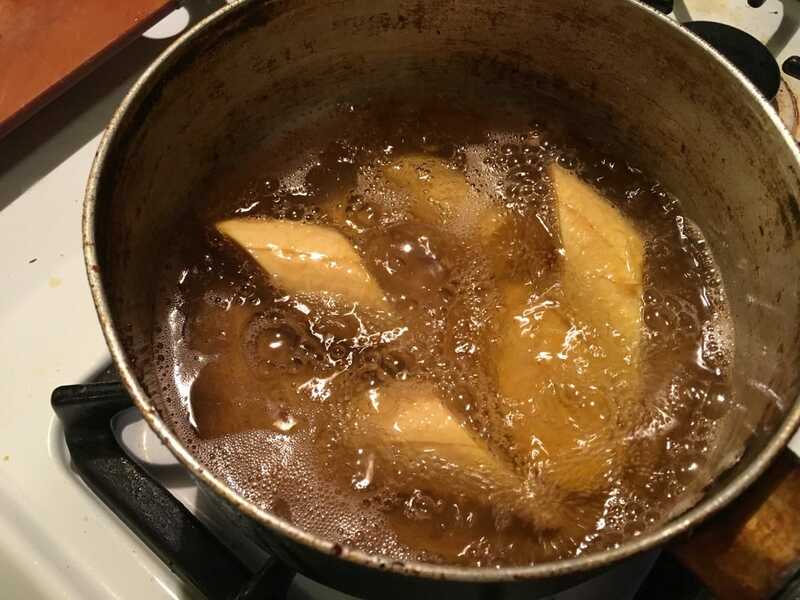 Depending on the size of the pot or pan you use, the oil must be high enough to fully submerge the plantains while frying. At least a minimum of 1 inch high. Turn the heat up to a medium and continue with the following steps. 2. 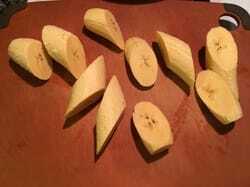 While waiting for the oil to heat up, cut the ends and peel the plantains. The only thing I hate about plantains is peeling them, especially if they are green. The greener they are, the harder they are to peel. My grandmother however, has some magic hands. She peels them so effortlessly, a skill I wish I could have acquired but never had. The riper they are, the easier they are to peel. They will also be sweeter as well. For this particular recipe, I recommend the green ones that are starting to slightly ripen. They'll have a lighter green appearance, will be a little easier to peel, and won't be sweet. 3. 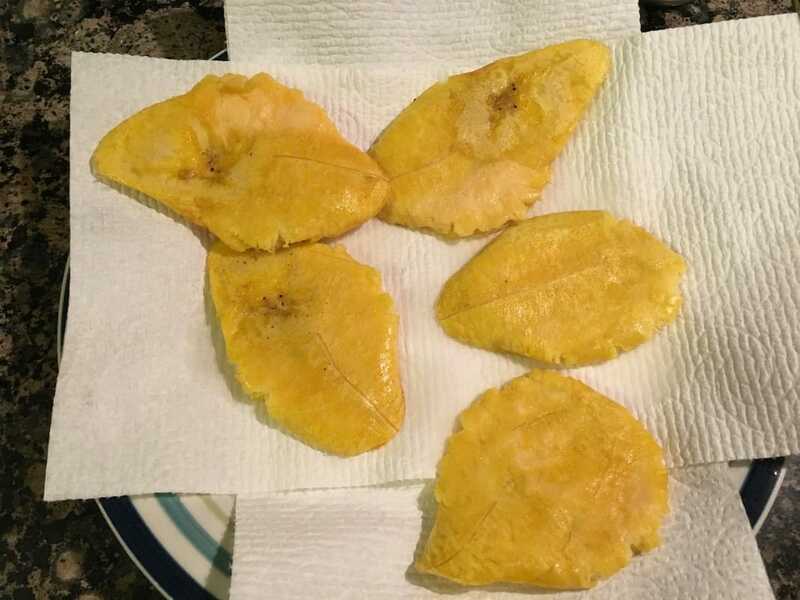 After peeling the plantains, cut them diagonally making about 5 - 6 pieces per plantain. Set them aside as you wait for the oil to reach temperature. 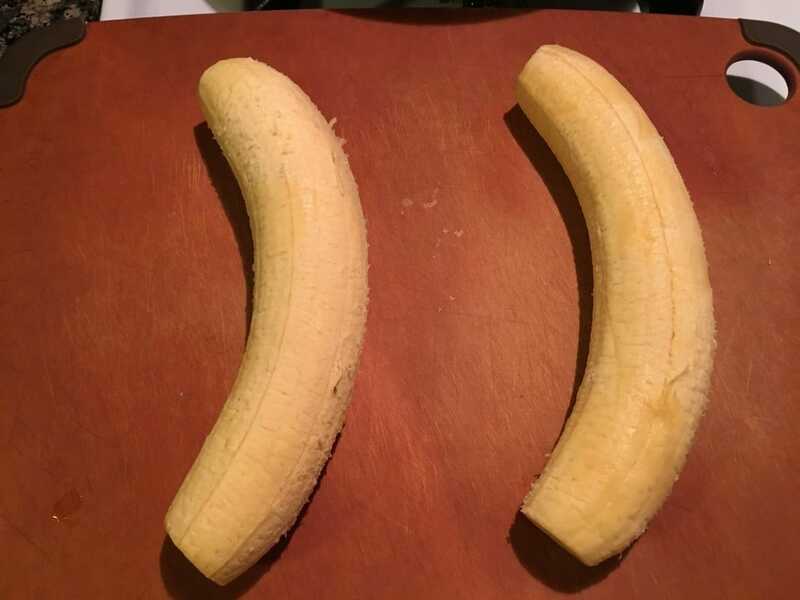 Don't peel them too far in advance. If they sit out too long, they will begin to oxidize and turn brown. 4. Once the oil has reached temperature at medium heat, add in a few of the plantain pieces being sure not to overcrowd the pan. Fry for 4 - 6 minutes. 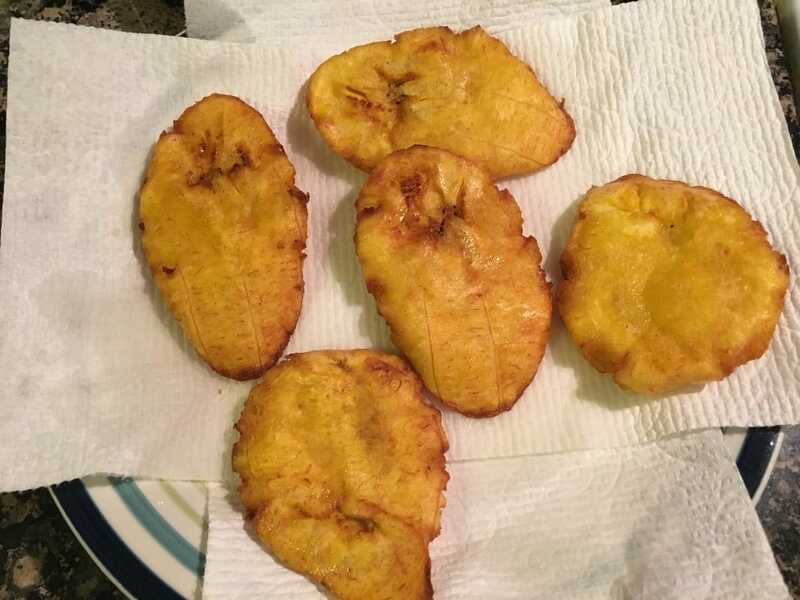 They need to be fried long enough to soften the plantains but not to completely brown them. The riper the plantains, the less time it needs. 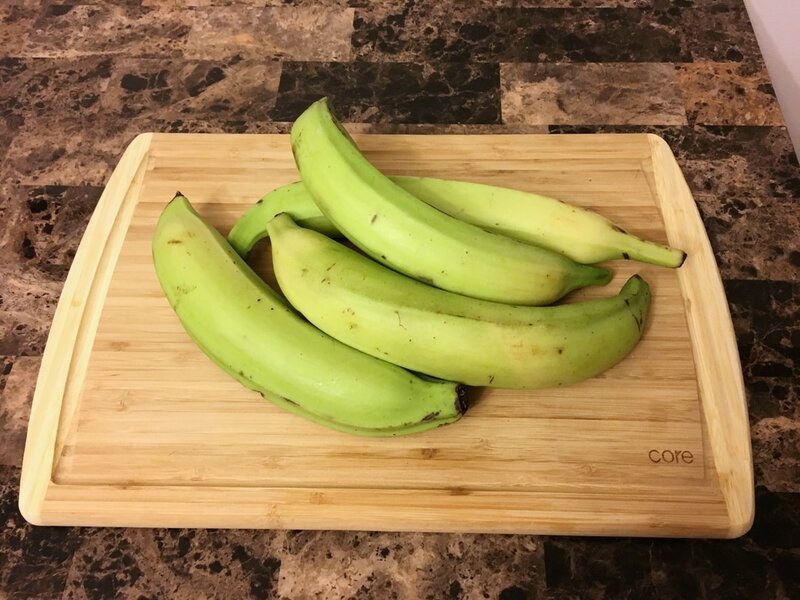 The greener the plantains, the more time it needs. 5. While the plantains fry, prepare the salt water solution. In a bowl, add 1/2 cup of water, 3/4 tsp. salt, and 2 tsp. lime or lemon juice. It can either be fresh squeezed or concentrate. Mix it until the salt dissolves and set aside. 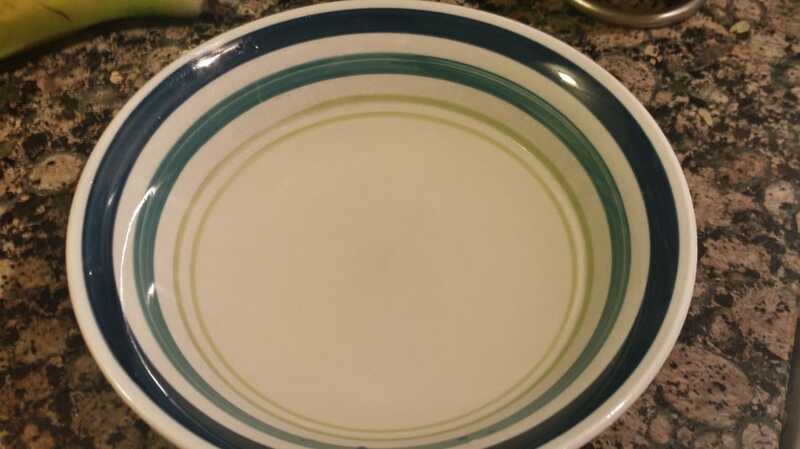 I know this bowl might look empty, but trust me, there's water in it. 6. 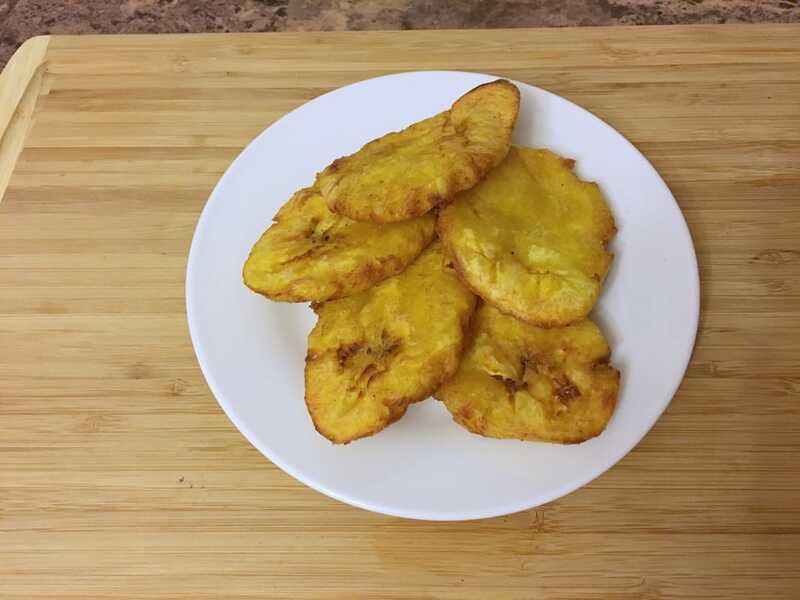 After plantains have fried, remove them from the oil and place on a paper towel lined plate. Using a plantain presser, or the smooth underside of a bowl, flatten each piece of plantain. Don't completely crush them or they will break apart. Another tip is to flatten them in between pieces of parchment paper. It helps keep them from sticking to the plantain presser or bowl. 7. The plantains will be fried a second time. However, the temperature of the oil must be increased to HIGH heat. 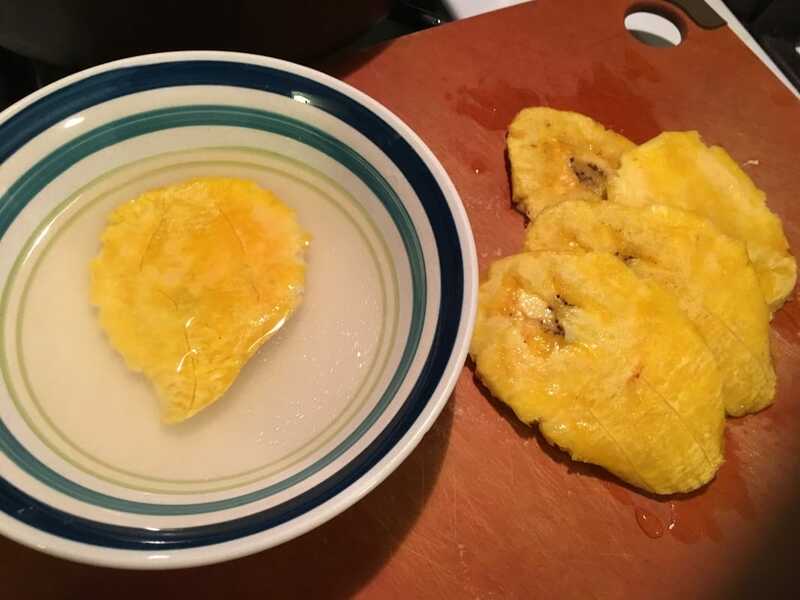 Dip each individual piece of plantain into the salt water mixture for about a second or two and place directly into the hot oil. IT WILL SPLATTER so please be careful. Fry for about 2 - 4 minutes, until the plantains are golden brown and crispy. Watch them closely, they may brown quickly. 8. 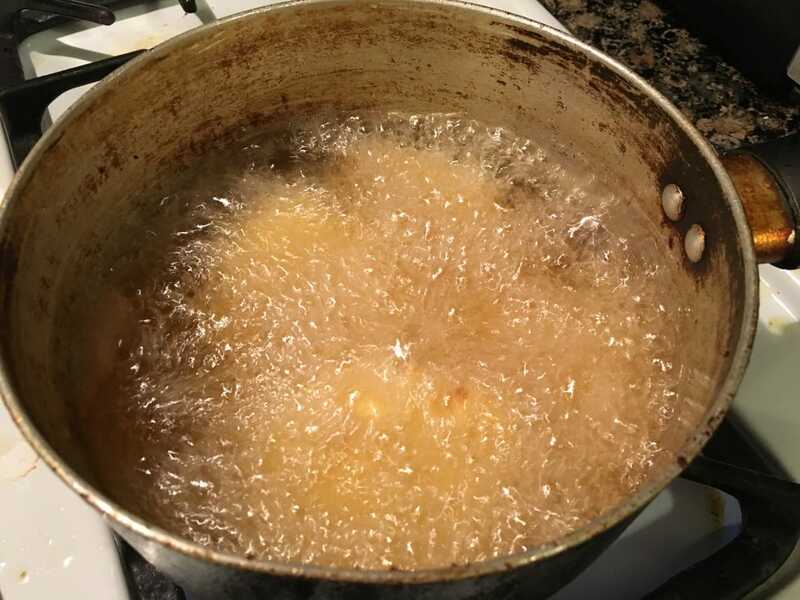 Once fried, remove from hot oil and place on paper towel lined plate to absorb any excess oil. 9. Serve immediately. 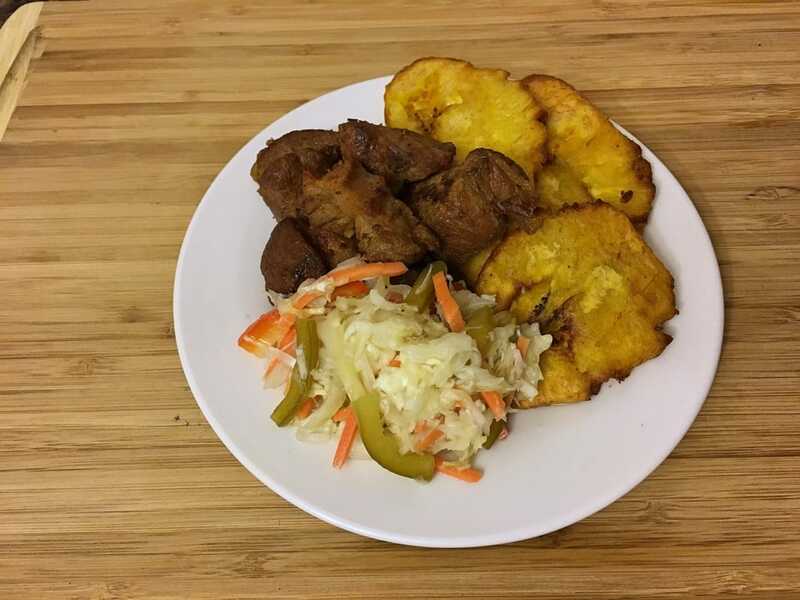 You can enjoy alone or with pikliz and griot! What do you think of this recipe? What do you pair your bunun peze with?